The Longest Day – Why Not Be Idle? – Find You in the Sun – A daughter's slow waltz with her mother's dementia. The Longest Day – Why Not Be Idle? Social media has been abuzz with The Longest Day Campaign, sponsored by the Alzherimer Association, in conjunction with June’s National Alzheimer’s Awareness Month. “On The Longest Day, teams around the world come together to honor the strength, passion and endurance of those facing Alzheimer’s with a day of activity. Held on the summer solstice, June 21, 2014, this event calls on participants to raise funds and awareness to advance the efforts of the Alzheimer’s Association.” – Alz website. One participates by selecting a hobby or activity that one loves, or the hobby of someone who suffers from dementia or Alzheimer’s and encourage others to join in the fundraising. Then to celebrate at day’s end. One of the concepts of The Longest Day stems from the notion that when you are with someone with dementia, an hour can feel like the longest day. When you are caring for them, feeding them, or simply sitting side by side with that person, time slows to a crawl. And while the day promotes a day of activity to honor the endurance of those with the disease, I advocate a time of sitting still. My mother suffers from dementia. When I visit her, I often refer to my time as an “A day” or “B day.” The term comes from my son’s high school schedule. His best days were often “B days,” shorter, more creative classes and teachers, more breaks. The “A days” were longer, with more grueling courses. So if Mom is having an A day, it is a time filled with anger, angst, anxiety, aggravation, and anything in between. If she is having a B day, she is boisterous, beguiling and beautiful. I tell this to my friend T, whose sister suffered from a stroke and dementia. “You never know what you’re gonna get, when you show up to visit,” she agrees. On the days when I say to Mom, “Lets go for a walk,” she will ask, “Why?” and refuse. Then, I might suggest the same minutes later and she will rise. But many times, she doesn’t want me telling her what to do. She has caregivers for that, and they actually leave her alone more often than I do. She wants me to sit. To hold her hand. To look her in the eye. And to do so takes not a day’s worth of activity, but a moment of intention. Of setting aside the phones and emails, and what you think your mother needs. A moment of stillness. Recently, in our conscious feminine leadership gathering, we discussed the notion of idleness, and one participant Phebe noted she often acted as if she were talking to her dog, when she reminded herself to be still. “Phebe, sit,” she would mutter to herself. Idleness is not a sport we as a culture excel in. It is also something that we cannot raise funds for. But it is a key aspect when raising awareness about dementia/Alzheimer’s. Because when we are idle, we see the little moments. We see around the edges of the person in front of us. We see all of them, not the person they used to be. I recently brought my mother to visit at my new house. After lunch and some time in the courtyard, I escorted her to the car, so I could drive her back to her care home. 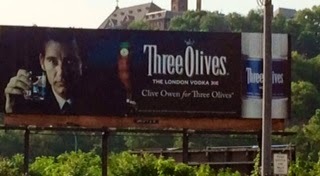 As we sat at a red light, beyond the intersection rose a billboard for Three Olives Vodka, with a photo of Clive Owen as pitchman. It was a long light, and as I turned to check on Mom, she was smiling back at the photograph. “He has a lot of light around him,” she said, pointing to rugged face emanating from off the billboard. “Light? What?” I didn’t get it, but she kept grinning ear to ear. I just wasn’t sure what she meant by it. Even as I turned the car in the opposite direction, she craned her neck to get one last glimpse of Clive. Now, I too, find Clive attractive in a British sort of way. But he in no way resembles any of those blue eyed handsome devils that Mom is famous for stalking, whether she knows that person or not. He doesn’t even have blue eyes. His eyes are green, which might be somewhat difficult to distinguish in the billboard. While I saw only dimness in the ad, she saw the light around the edges of his face. The moment passed, and Mom began reading green highway signs once more. But my mother still saw light in something as simple as an advertisement, and I need to be mindful enough to honor that. I will probably visit my mom tomorrow. I will probably give her a few instructions that she may or may not have wanted to hear. I might comb over her hair and cause her some aggravation. I might hug her, and ask if she will hug me back. But the best awareness I can raise is through my own consciousness. Afterall, a wise boater once told me, and reminds me often, “Idle moves the boat forward.” And in the slippery waters of dementia, that seems like the best course of action. Author’s note: Remember Alzheimer’s is just one form of dementia and not the other way around. View this page and you will see from a marketing standpoint, that dementia and Alzheimer’s are used interchangeably, mostly for the benefit of convenience or branding. http://act.alz.org/site/TR?fr_id=5860&pg=informational&sid=18343. Of course, this is another issue for another time.